Partial table of contents: THE PERSPECTIVE OF INTERNAL MARKETS. Corporate Perestroika: The Internal Market Economy (R. Ackoff). Reconsidering ''A New Corporate Design22 (J. Forrester). Internal Markets and Learning Organizations: Some Thoughts on Uniting the Two Perspectives (P. Senge). FROM CORPORATE BUREAUCRACY TO INTERNAL ENTERPRISE. Principles That Make MCI a Dynamic Organization (B. Roberts & J. Zimmerman). The Executive Office Should Also Be a Profit Center: Highlights from a Career at General Motors and Clark Equipment (J. Rinehart). Corporate Integrity and Internal Market Economies: Experiences with Armco in Latin America (J. Bartol & A. Geranmayeh). Creating Customer-Focused Research and Development: A Plan for Esso Petroleum Canada (J. Charlton). ENTERPRISE IN THE PUBLIC SECTOR. Ten Ways to Turn DC Around (D. Osborne). Appendix. References. 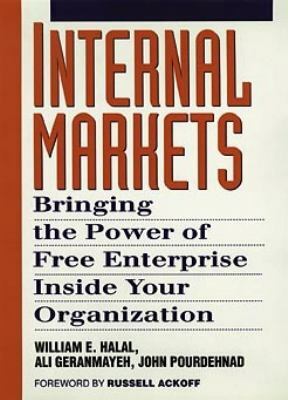 Index.Halal, William E. is the author of 'Internal Markets Bringing the Power of Free Enterprise Inside Your Organization' with ISBN 9780471593645 and ISBN 0471593648. Loading marketplace prices 4 copies from $0.97 How does the rental process work?